Ice cream is one of the most popular desserts enjoyed in the United States. In the last few years, food trends have buried classic vanilla and chocolate to bring about new exciting flavors like cherry amaretto or salted licorice. Although these flavors might not appeal to you, there is much to be gained by trying a new spin, like turmeric ice cream. Not only is it savory, it’s also colorful and creamy. This ice cream takes golden milk to a whole new level. Soak the cashews in a bowl of water overnight. If you’re short on time, simply soak them for 2 hours. Once the nuts are soaked, line a meatloaf pan with parchment paper. This will become your ice cream container. Place the container in the freezer while you prepare your ingredients. Remove the cashews from the water and place them in a food processor with all the other ingredients. Pulse until the mixture is smooth and well combined. Remove the prepared pan from the freezer and pour the ice cream mixture into the pan. Cover the ice cream with parchment paper so that it comes into contact with the mixture. Place the pan in the freezer overnight to harden. 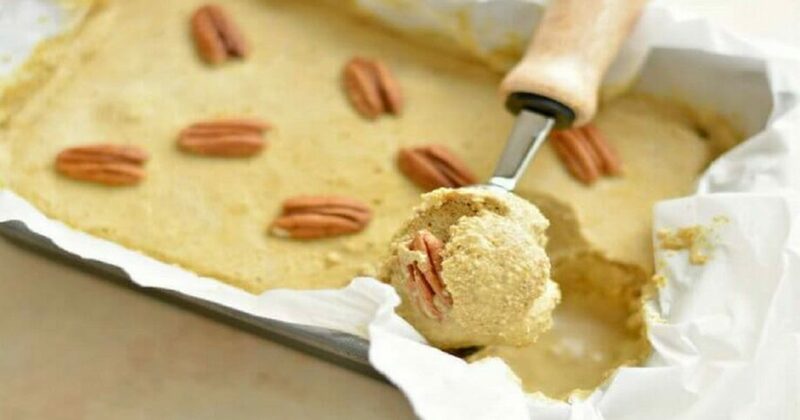 Top with more pecans and enjoy! Turmeric is one of the most healthy foods in the world. It’s even more effective than pharmaceutical drugs in treating most diseases. The rhizome is proven to reduce pain and improve mobility in patients with arthritis or osteoarthritis. It’s even compared to ibuprofen in terms of efficacy. Additionally, it fights bad cholesterol, improves digestion, and reduces inflammation (1). Plus, the spice has the ability to reduce blood pressure and improve mood (2). Best of all, turmeric is easy to use, so get creative! Cashews give this ice cream a nice creamy texture, but that’s not all. These nuts are full of vitamins, minerals, and antioxidants (3). Among other things, they contain vitamins E, K, and B6, along with minerals like copper, phosphorus, zinc, magnesium, iron, and selenium. These nutrients fight heart disease by helping the body form and utilize red blood cells. Cashews also contain arginine, a compound which protects the inner lining of artery walls. Their heart-healthy fats and protein help you maintain a healthy weight. Plus, cashews can even decrease your risk of obesity, diabetes, heart disease and overall mortality (4). 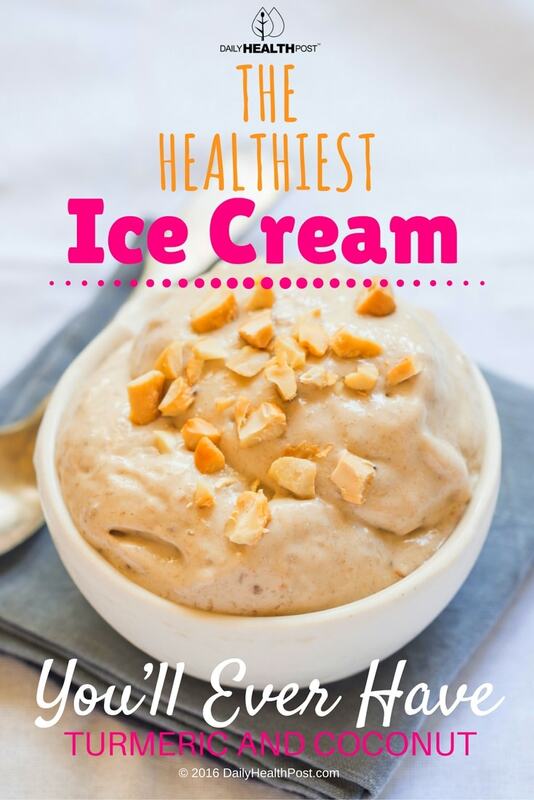 And that’s just the beginning of the benefits of this ice cream: ginger fights inflammation, coconut improves brain health, and cinnamon stabilizes blood sugar levels.